Modelling psychiatric disorders in animals has been hindered by several challenges related to our poor understanding of the disease causes. 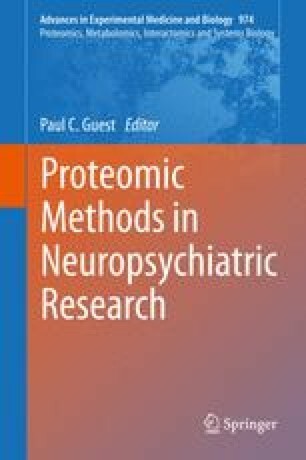 This chapter describes recent advances in translational research which may lead to animal models and relevant proteomic biomarkers that can be informative about disease mechanisms and potential new therapeutic targets. The review focuses on the behavioural and molecular correlates in models of schizophrenia and major depressive disorder, as guided by recently established Research Domain Criteria (RDoC). This approach is based on providing proteomic data for aetiologically driven, behaviourally well-characterised animal models to link discovered biomarker candidates with the human disease.